Age-related macular degeneration (AMD) is now the leading cause of vision loss among people over 65 in North America. The macula is the central portion of the retina, which is the light sensitive tissue in the back of the eye. It is responsible for the sharp, central vision required for reading, driving, and seeing fine details. When the macula is affected by AMD, the change may be abrupt and very noticeable, or so gradual that it is not noticed, especially if only one eye is affected. Since AMD affects only the central vision, complete blindness is not a result of AMD. The risk of developing AMD increases with age. Those over 75 have a one in three chance of developing the disease. In addition to age, risk factors include smoking, obesity, being Caucasian, being female, and having a family history of AMD. Early symptoms of macular degeneration may include blurred distance vision, difficulty reading, a dark spot in or near the central vision and distortion of straight objects. Since AMD is painless and the vision changes can be subtle, getting regular eye examinations from your eye doctor is critical. If AMD is suspected, a comprehensive eye examination is the first step, including a thorough history, slit lamp examination, various forms of vision testing, as well as other special tests to evaluate the macula. The latter usually includes fluorescein angiography, a photographic evaluation of the retinal circulation. In addition, other imaging studies of the retina may be helpful. 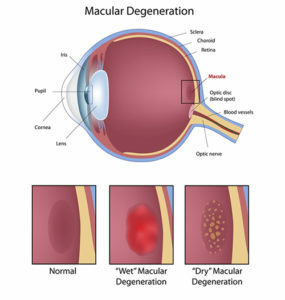 There are two forms of macular degeneration. Dry AMD, the most common form, involves a slow, progressive deterioration, often leading to atrophy of the macula. Wet, or exudative AMD is responsible for 90% of the vision loss associated with the disease. Wet AMD is caused by the growth of new abnormal blood vessels beneath the retina which frequently leak, bleed, and form scar tissue which can destroy the overlying retina. Wet AMD is considered to be advanced AMD and is more severe than the dry form. Since the dry form of AMD can progress to the wet form, dry AMD should be monitored closely for signs of progression. There is no way to predict if or when the dry form of AMD will progress to the wet form.